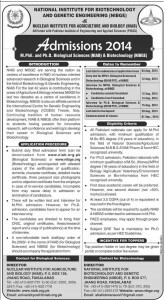 National Institute of Biotechnology & Genetic Engineering (NIBGE) & Nuclear Institute for Agriculture & Biology (NIAB) Faisalabad Admission Notice 2014 for M.Phil. & Ph.D.in Biological Sciences & Biotechnology. 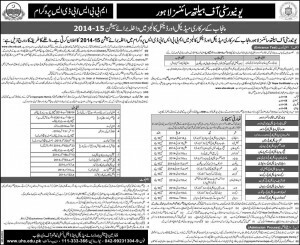 Faisalabad: Government College Women University Faisalabad (GCWUF) Admission Notice For BS (HONS) Food Science & Nutrition 2014. Faisalabad Institute of Research, Science and Technology Admission Notice 2013 Faisalabad: Faisalabad Institute of Research, Science and Technology (FIRST) Admission Notice 2013 for B.Sc. (Hons.) Biotechnology.